This is not a full account of the history and workings of the hurdy-gurdy, just an attempt to answer some of the most common questions I get asked. The gurdy works on the same principle as a violin: the wheel acts as a bow, continuously bowing the strings, and these pass through a keyboard which does the same job as the fingers of the left hand would on a violin, changing the length of the string to produce the tune. The rhythmic buzzing noise is produced by a small loose bridge under one string, which vibrates when the wheel is momentarily flicked. Yes and no. The left hand just plays a keyboard, much like any other keyboard. The tricky part is buzzing with the right hand, which takes a while to master, and is a real art to play well. Again, yes and no. Although the instrument originated in medieval times it developed considerably afterwards, so that later instruments are quite different and much more sophisticated. Mine is more of a 19th century French style gurdy, but is in fact a thoroughly modern working instrument, made by Chris Eaton, with modern wheel bearings and geared tuning pegs. Where is it from? Is it Celtic? Not really. 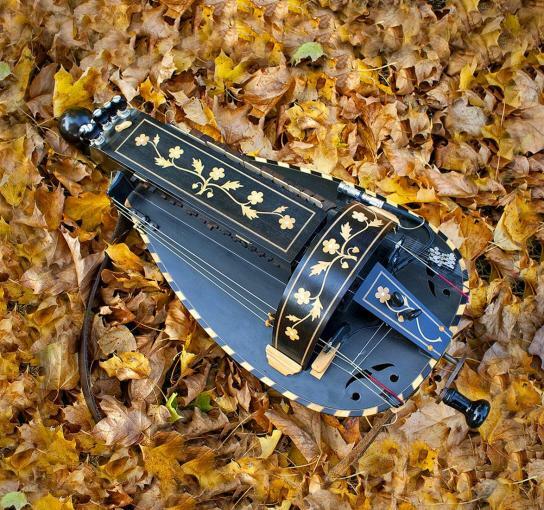 Hurdy-gurdies have travelled all over Europe. There are two main centres of playing in France and Hungary. The instrument is not particularly associated with Celtic regions. People often feel it sounds Celtic because they associate the drone (a single note playing continuously underneath the melody) with bagpipes, which are most commonly found nowadays in Celtic music. However bagpipes and other drone instruments were once commonplace in folk music from all parts of Europe.